EventsPolicy Roundtable: "Improving the Quality of Health Care at the Grassroots Level in Viet Nam"
Policy Roundtable: "Improving the Quality of Health Care at the Grassroots Level in Viet Nam"
Professor Hy Van Luong presents key findings and policy recommendations from the Population Health Study. 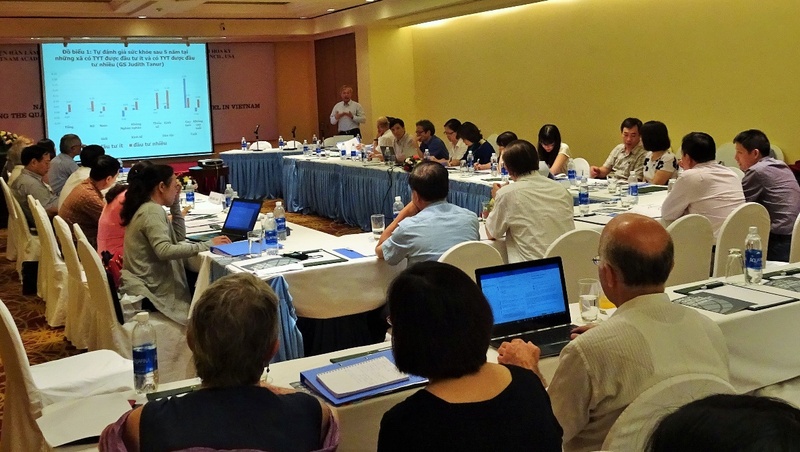 On July 18, 2017, SSRC Vietnam Program staff organized a Policy Roundtable to engage stakeholders in the Vietnam Academy of Social Sciences (VASS)-SSRC logitudinal "Population Health Study in Three Provinces" and highlight key findings and policy recommendations from the study. The 49 roundtable participants comprised high-level and influential Party and government members, representatives from the Ministry of Health (MoH) and key national agencies and local NGOs, and project team members. The policy community welcomed the study's focus on commune-level health, emphasizing their importance to policymakers and relevance to ongoing policy debates. The Population Health Study was designed to measure the results of the Atlantic Philanthropies' comprehensive programming aimed at improving the commune health center (CHC) system in rural areas. The project goals include an assessment of how well the CHC model and its components work for different populations, particularly the disadvantaged, and an examination of change over time with respect to health-seeking behaviors and care utilization and satisfaction, perceptions of CHCs, health knowledge and practices, and health status. (1) From 2013-14, among the 12 communes surveyed, from 19% to 63% of insured patients did not use their health insurance for care and treatment of an acute illness. Investment in CHCs has helped increase utilization of health services among insured patients. (2) CHCs that received more investment in facilities, equipment, customer service and professional training have operated more effectively than those with less investment. In the more treated communes, average self-reported health improvement has also increased from Round 1 to Round 2, both overall and in sub-groups, whereas in the less treated communes, average self-reported health improvement remained the same or decreased. 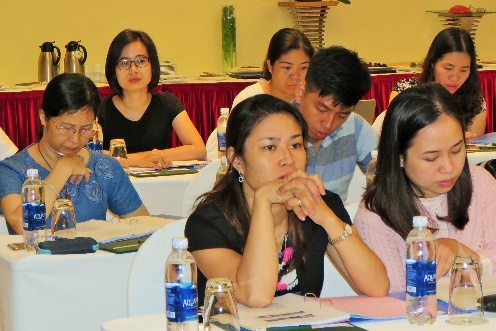 Participants from the Ho Chi Minh National Academy of Politics; the Ministry of Labor, Invalids, and Social Affairs (MOLISA); Vietnam Women's Union; and the Committee on Ethnic Minority Affairs consider the policy implications of the findings presented. "Iron supplement intake and antenatal care visits have increased in CHCs that have received Atlantic Philanthropies investments, compared to those that did not." "We would like to know more [about] the demand side. Are the CHCs sufficiently meeting the demands for antenatal and postnatal care?" 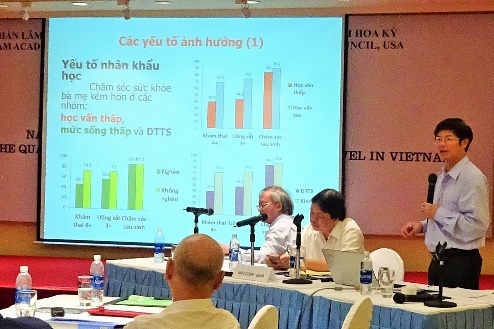 Prof. Minh presents data on maternal care among vulnerable women in Vietnam. Assoc. Prof. Dr. Sang presents flexible, diversified models for CHCs, based on context, demand, population, geography and available resources. "The model of the CHC for today must be different from the one we had before. I really appreciate the model that you've proposed. My recommendation is that you social researchers, SSRC, and we should find funding to continue this type of study." "There is still little assessment of family doctor model or effectiveness of public-private partnership. If CHCs are [privatized], how can this be done with equity and equality? There should be more policy analysis research on this." "We can still have more opportunities to continue with this research. Your research is of good value and it has introduced very good procedures and recommendations." The Head of the Dept. of Health Insurance, upon hearing that there is perceived discrimination in service quality in using health insurance as opposed to paying directly for services, agrees that the MoH would like more research to help solve this problem. During the two discussion sessions on Feasibility and Implementation Challenges, participants voiced their appreciation for the value of the information and timeliness of policy recommendations provided, and also identified several of the Study’s critical focus areas that address immediate policy concerns. These include health insurance (HI) utilization and perceived discrimination, or inferior services, when using HI as opposed to out-of-pocket pay; assessing whether CHCs have the capacity to provide antenatal and postnatal care needs; and determining whether CHCs can form effective public-private partnerships that will not undermine their function in providing public health care and preventative health services. "The MoH has not agreed on the policy of public-private partnership for healthcare for the CHC, because we have had very short assessment ... As a person who would advice MoH leaders in making policies, I welcome all the opinions and recommendations today. 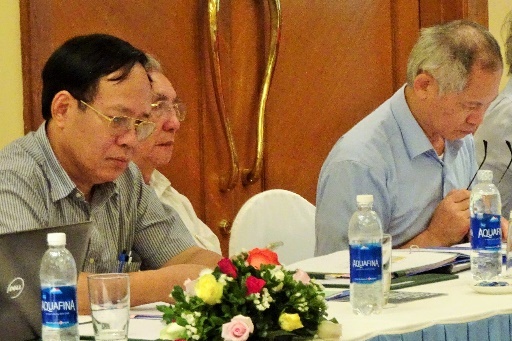 I wish that in there future there would be cooperation between the [Vietnam] Academy of Social Sciences and the healthcare sector in research. I believe the result would be more helpful to the recommendations for policymaking." 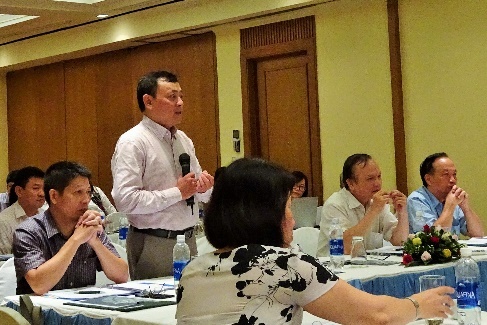 Participant recommendations included sharing access to data, presenting findings to the highest tier of policymakers, increasing the pace of dissemination to meet the rapidly changing policy context, and continuing policy-oriented research with even closer cooperation between social scientists and the health sector. Many participants expressed their appreciation for the findings, the opportunity for dialogue, the value of social research on health topics and a hope for continued engagement among researchers, the health sector, civil society and government. "I'm now 80 years old and this is the first time I heard social researchers talk about health care. I would like to thank [Atlantic Philanthropies] for the money to organize this and SSRC in helping with this, so that we can have a seminar like this. I have only one recommendation: How we can have similar opportunities like this so that we can share our opinions. We would really like to hear your opinions and contributions. What we heard today in the report is very good." "...[S]eminars like this should have been put in a different level, organized at a higher level. 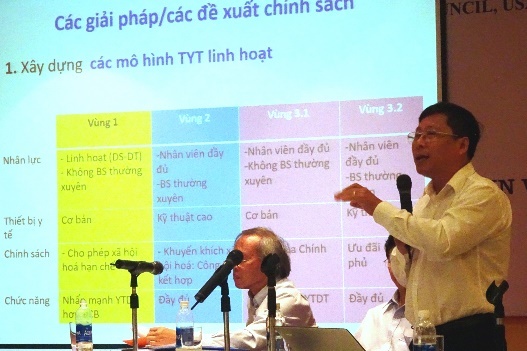 For example, I think there should have been the participation of the National Assembly and leaders in the MoH, because these are the agents that make recommendations for policies for healthcare at the grassroots level, they research issues related to the backbone of the healthcare sector in Vietnam ... Therefore, if possible, I think when there are research findings like this, if we could have disseminated these findings to those people, I think it would have been very good." "...[T]his is the first time we had the chance to sit with each other like this between social researchers and healthcare experts to share our opinions. We hope we have similar opportunities in the future, because it is impossible to separate what is called healthcare and what is called society or sociology, because they are related to humans and their related issues. If we separate the two, we cannot solve the current problems."